Snow rabbits and nandina tree.They're real feeling of winter. New Year greeting card with this kind of illustration is often used in Japan. These kind of illustrations are also used for our New Year's card. They are believed to bring happiness. "Kagamimochi" is a large,round rice cake offered to the gods at New Year's. "Osechi" is Japanese traditional New Year's cuisine.The box resembles bento box. "Otoso" is sake. Otoso is drunk to flush away the previous year's maladies and to aspire to lead a long life. "Nishijin Weaving" is typical traditional craft in Kyoto. It's very famous in Japan. "Nishijin" is a name of an area in Kyoto. This traditional craft has long history,over 1200 years. This weaving industry has grown under the influence of Jacquard weaving technique in France,Lyon. The character of "Nishijin Weaving" is, for example, the brilliant coloring. And we can feel a sense of season from each design. 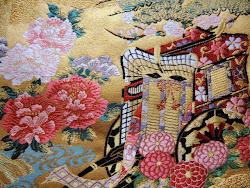 Today Kimono population is dwindling in Japan,but Nishijin Kimono is of high value even now.